Habitat: A principal tree of hardwood forests that grows in moist soil and is commonly found in pastures, meadows, farms, and along roadsides. 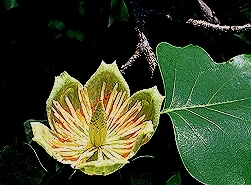 Characteristics: Tuliptree easily grows to a height of 100 feet and higher. The tulip-like flowers are a striking yellow-orange-green, and are a major nectar source for honey bees. The leaves are 6-10 inches long and have a distinctive appearance.